Projekt Cupcake: Nutty or nice? als ich die Farben und das Motiv des Inspirationsbildes bei der Lawn Fawnatics Challenge gesehen habe, musste ich gleich an die letzte Lektion meines "City Sidewalks" Copic Kurses von Sandy Allnock denken... Ich hatte mich bereits früher daran versucht, bin jedoch gnadenlos gescheitert und musste das Stückchen "Kunst" entsorgen. Für dieses Challenge-Thema habe ich es allerdings erneut versucht und dieses Mal hat es auch irgendwie funktioniert. 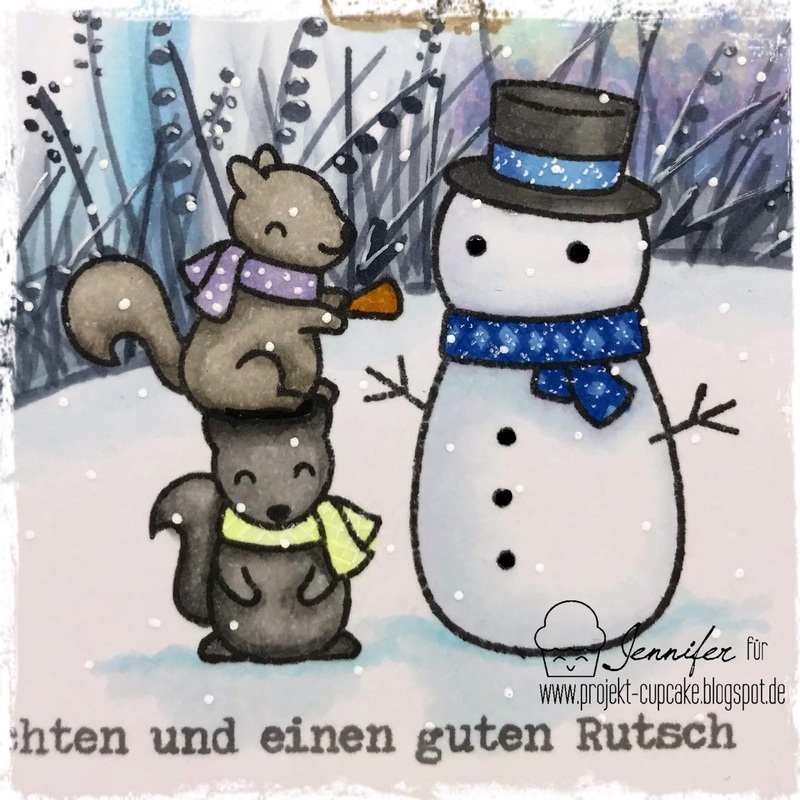 Ich habe für meine Karte zuerst den Schneemann und zwei der Eichhörnchen aus dem diesjährigen Stamptember Set gestempelt, maskiert und dann meinen Hintergrund gezeichnet. Im Anschluss habe ich meine Stempelmotive koloriert und schlussendlichen meinen Gruß gestempelt. When I saw the colours and theme of the inspiration picture at the Lawn Lawn Fawnatics Challenge I had to think about the last lesson of my "City Sidewalks" Copic Course by Sandy Allnock ... I already tried it earlier, but I failed mercilessly and had to dispose of the bit of "art". However, I tried again for this challenge and this time it worked somehow. 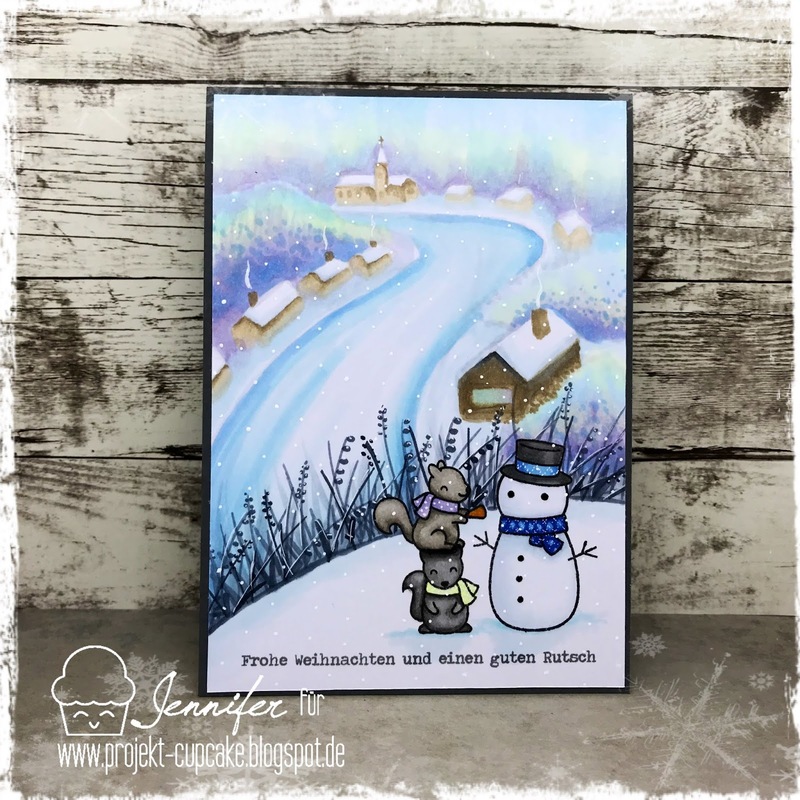 At first, I stamped the snowman and two of the squirrels from this year's Stamptember set, masked them and then painted my background. Afterwards I colored my stamped images and finally stamped my German greeting ("Merry Christmas and a happy new year"). WOW! I am in awe of your card and talents! Stunning coloring and I LOVE the scene you made. You really created a lovely piece of artwork! Amazing! Thank you so much for playing the Lawn Fawnatics Challenge!